Because one size does not fit all, FOX IV offers a range of print & apply or apply only labeling equipment to suit various needs. For low volume label printing applications such as tickets, hand applied shipping labels, pick tickets, cross docking or healthcare applications, ask about our extensive range of table top and mobile printers. Primary labeling applications, such as consumer product labels and regulatory labels, are the domain of label applicators. Labeling with variable information at higher volumes in an automated setting, such as shipping labels, pallet labels, inventory labeling and more, are expertly handled by FOX IV’s own line of industrial label printer-applicators, label applicators and other labeling equipment. 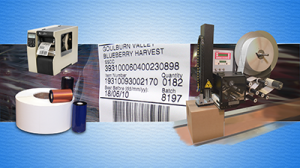 From desktop and mobile printers , to pre-printed label applicators, to fully automated label print and apply systems, FOX IV has you covered, no matter what your tag or labeling requirements.